Many aspects of chemistry, particularly physical and theoretical chemistry, require a good understanding of advanced mathematical methods. The Chemistry with Mathematics BSc offers the opportunity to gain a fundamental understanding of the origins of chemical behaviour, while exploring exciting developments at the interface of chemistry with the other physical sciences. AA in Mathematics and Chemistry required. A score of 18 points in three higher level subjects including Mathematics and Chemistry at grade 6, with no score below 5. A score of 17 points in three higher level subjects including Mathematics and Chemistry at grade 6, with no score below 5. AAA at Advanced Highers (or AA at Advanced Higher and AAA at Higher), including Mathematics grade A and Chemistry at Advanced Higher. Successful completion of the WBQ Advanced Skills Challenge Certificate plus 2 GCE A-Levels at grades AAA, including Mathematics and Chemistry. You will have the opportunity to select optional modules from the wide range available within UCL's highly regarded Department of Mathematics. This programme is offered either as a three-year BSc or as a four-year MSci. The first two years of study are identical, so you can defer which to opt for until the end of your second year. We advise you to select the four-year MSci initially as this keeps more options open. The chemistry content directly follows that of the single-subject Chemistry programme. You will cover the full range of chemistry core components, together with relevant optional modules in chemistry such as Quantum Mechanics, Computational Chemistry and Numerical Methods. The mathematics component takes up around 25% of the programme. In the first two years there are a number of compulsory mathematics modules including modules in pure mathematics, advanced calculus and geometry, group theory and linear algebra, while in the final year you choose from the wide range of Mathematics options on offer. In the final year you also undertake a compulsory literature project. You will select 0.5 credits from a wide range of optional modules. You will select 1.0 credit from a wide range of Mathematics, Chemistry and other approved undergraduate options. 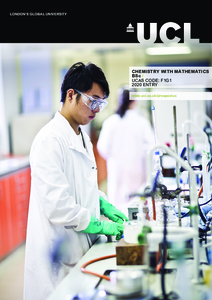 Detailed course descriptions are available on the department website: Chemistry with Mathematics BSc. Many recent graduates have continued as researchers at universities including PhDs at UCL, Imperial, Oxford, Cambridge, Bristol, Edinburgh, Harvard, Manchester and NUS Singapore.